The original statue was erected on this spot in the year 1712 to commemorate the completion of Saint Paul's Cathedral. The 4 female figures around the base represent: Britannia, France, America, Ireland. It was during Queen Anne's reign that the rebuilding of St Paul's, after the 1666 Great Fire, was completed. 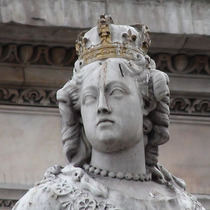 The original statue was erected in 1712, an integral part of the design. It deteriorated and was replaced in 1886. To create the replacement copy Belt was appointed in 1885 but carried out only the first part of the work since in March 1886 he was accused of “obtaining money by false pretences”, and being found guilty, sent to prison. Malempre was brought in to complete the work. The original statue was acquired by Augustus Hare and moved to the grounds of his country house, Holmhurst St Mary near Hastings. The house has since been used as a school and a convent, and is now subdivided into private living accommodation. The grounds were also developed into housing but the statue remains: "The layout also had to respect the existing Grade II* listed statue of Queen Anne which used to stand in front of St Paul’s Cathedral." Whether it received any conservation as part of the development is not known, but in 2003 Ward-Jackson said it sorely needed some. 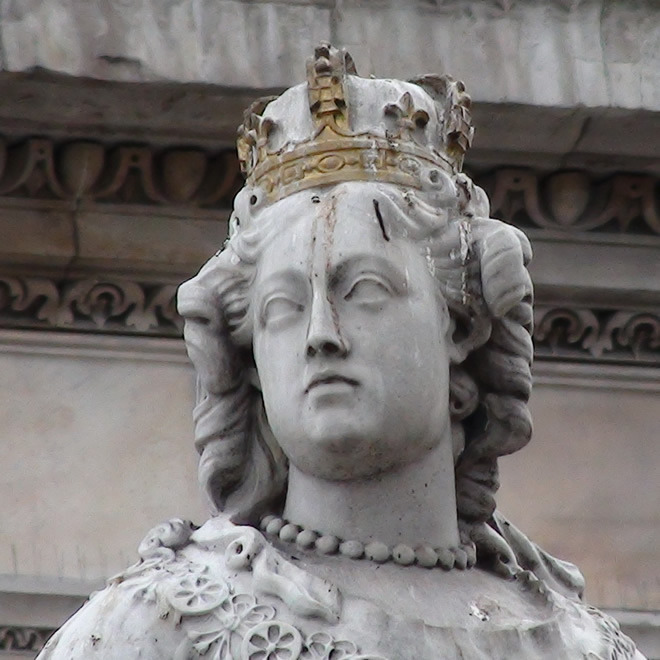 2018: Footprints of London explains that in 1769 the (original) statue was attacked by a Lascar, who removed the globe, smashed off the arms and broke the sceptre. It was repaired but it seems it never fully recovered. Our information on this statue mainly comes from the magnificent "Public Sculpture of the City of London" by Philip Ward-Jackson which has seven pages on it. Chairman of the City Lands Committee in 1886.